This recipe is ideal for those who want a sweet vegetable meal to stand on their table. Moreover, it will go as a nice dessert. Roasted acorn squash is definitely worth trying! 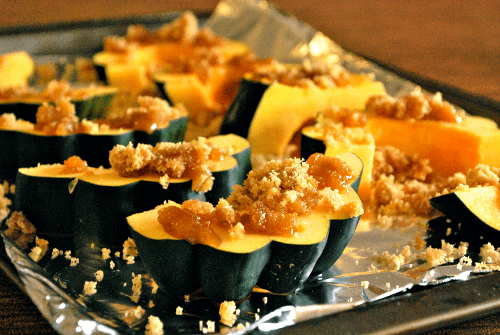 To begin with, preheat the oven to 350 degrees and prepare the squash. Cut it in half and scrape out all the seeds. Place the halves onto a baking sheet with the cuts up, sugar and pepper it. You can also sprinkle them with the olive oil if you want to. If necessary, you can also cut the squash lengthwise into quarters. In a separate bowl beat the sugar with butter and almond liqueur until creamy. Then cover the pumpkin halves with the butter mixture on the cut sides and crown them with 2 sage leaves. Coat them with crushed cookies and put into the oven. Bake for 30 minutes until they get soft and grease the squash with any remaining butter after 15 minutes pass.